Siamak comes towards the horse. Horse hits him. He thinks that even his animals were faithful to him. Princess Chanda prays to horse to be with her as she is scared. Kaurvaki feels jealous to see Ashoka comes closer to Anindini. But Ashoka’s concentration is somewhere else. Kaurvaki thinks that Ashok wanted her to feel jealous. She moves towards Sushim. Ashoka then feels jealous that she was walking towards the Susheem. Ashok increases his voice to irritate her and asks Anindini to keep on practicing. Kaurvaki asks Sushim to go for a hunt. Sushim agrees to help her in hunting. Ashoka gets tense. On the other side, Siamak tries to do the same with Sushim’s horse. Susheem helps Kaurvaki to sit on the horse. Both having an eye on each other. 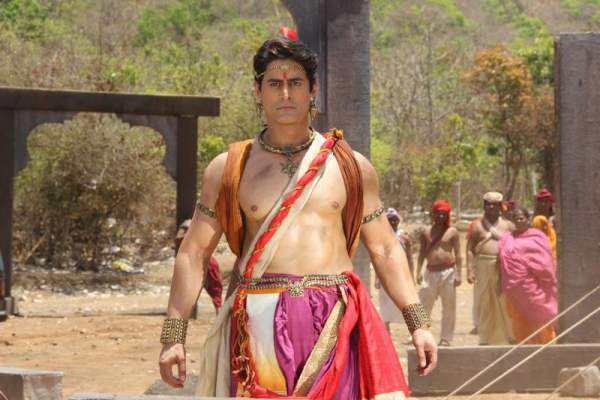 Princess Chanda comes and gets disappointed as Sushim leaves without her. Ashok hears animal’s voice and aims to strike it. Sushim’s aim is to make him unsuccessful. Kaurvaki’s horse becomes out of control, and she shouts Ashoka’s name. Ashok moves towards her to help her. He asks her to give her hand. Kaurvaki gets unconscious. Ashoka manages to hold her hand and they both fall and rolls. Sushim and Princess look them down the cliff. They are unable to find them in the steep waterfall. Sushim gives Chanda sympathy and says that Ashok could not die and would come back. Siamak feels very happy as he feels that his plan has been successful. Susheem thinks that it must be the plan of someone, it could not be an accident. Sushim comes outside the forest and thinks that Saimak must be behind this. Ashoka comes out of the water with carrying unconscious Kaurvaki in his hands. He calls her name and asks her to open her eyes. She again becomes unconscious, and she finds her Raksha Kavach has gone.